Darkness, strange creatures, high pressure, abyss, sea caverns, words that describe the unknown deep underwater world and sound mythical and full of thrill. 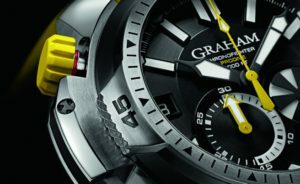 GRAHAM wanted to make these words become reality and create a true luxury diver’s watch for professional adventurers and watch addicts. 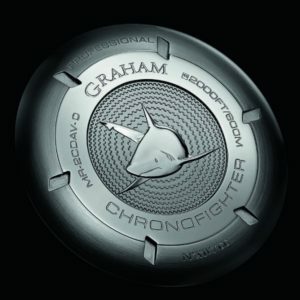 The Chronofighter Prodive is for the first time equipped with a patented start/stop/reset mechanism which allows the watch to be used to the limits the human being can dive to. However, each watch is tested to resist and go beyond 2000 feet. Advanced manufacturing processes have been used to develop the perfect and stylish diving instrument. Clear, colourless, odourless, water covers 70% of Earth and is essential to all living creatures. 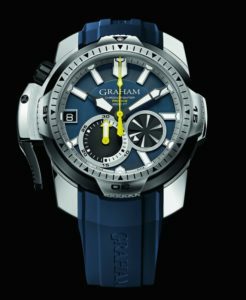 GRAHAM is devoted to the creation of timepieces which respect nature and unknown territories and also give boldness to our users to experience the GRAHAM exciting world. Equipped with an isothermal diving neoprene rubber suit and gloves, the diving experience must be a sequence of easy and successful operations. 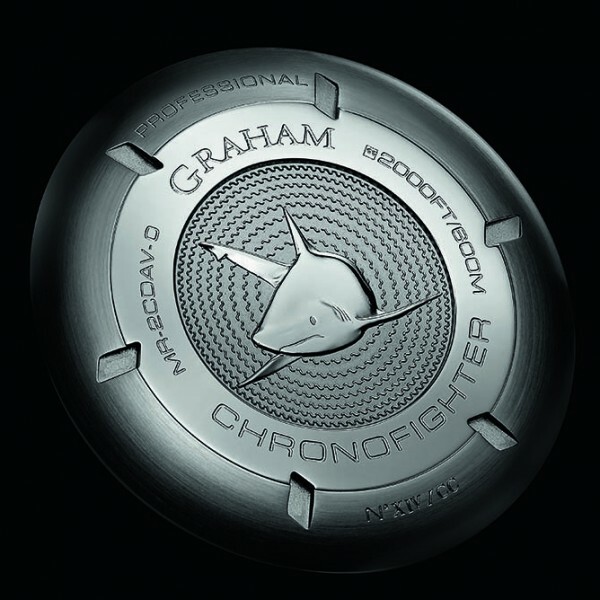 GRAHAM has developed a brand new diving chronograph, Chronofighter Prodive, which will give life and light to this incredible world of deep water and make you perfectly amphibian. The yellow-coloured Chronofighter Prodive professional shines forth from underwater and will be the diver’s watch to find your way to venture in total assurance. 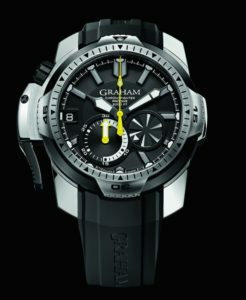 The lever, famously GRAHAM and patented system, is undoubtedly the best system to activate the chronograph without fail. Placed on the left side of the case, the trigger is completely rethought to become the only control pusher of the chronograph start/stop and reset. Easy for any divers to activate the functions with thick neoprene gloves. The unidirectional rotating bezel is adorned with a special pattern to ensure a better grip in addition to a 120-position notched wheel. And the rubber strap with the folding buckle featuring a diver’s extension will become a part of your suit. 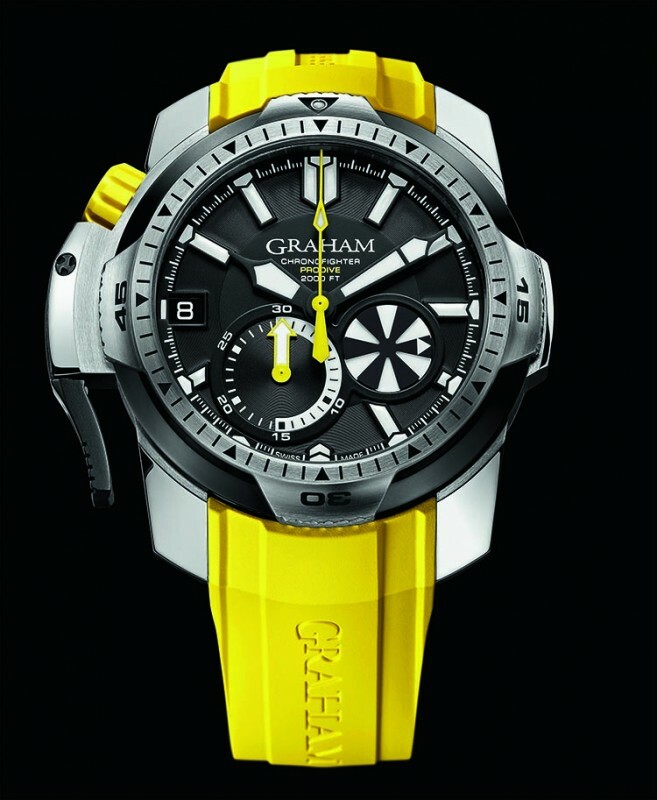 Sea, lake, river, ocean, the GRAHAM Chronofighter Prodive is able to adapt to all types of diving and light changes. Deeper you go down weaker is the light and darker is the underwater world. A dark blue and black zone that spreads around you like ink in a glass of water. It will prevent you diving into troubled water thanks to a new generation of luminescent coatings, totally free of radiation. Two colours of luminescent indications are displayed and will be perfectly visible in great depths. The watch is perfectly readable from 25 cm in murky conditions. 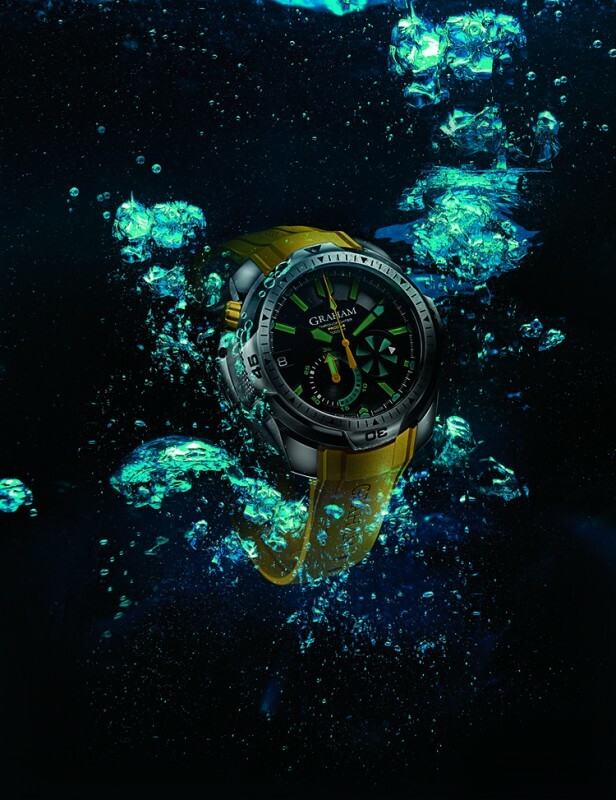 Equipped with an automatic helium valve and a yellow rubber crown with an automatic locking system (bayonet) and a red safety ring which notifies the crown unlocking, this dependable chronograph will assure you safe diving quests. Pressure, water, temperature change resistant, functional and fully readable in the dark, sophisticated design. The GRAHAM watch is free of electronics and depends on absolutely reliable mechanical timekeeping. 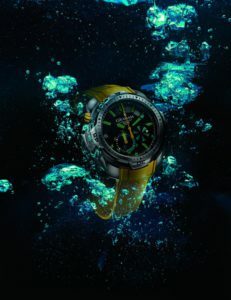 The Chronofighter Prodive becomes the reference luxury diving watch. Main features also include: 45 mm steel case, calibre G1750, automatic chronograph, 25 jewels, 28’800 A/h (4Hz), Incabloc shock absorber, 48 hours power reserve, water resistant and fully functional at 2000 feet/600m, unidirectional rotating bezel, propeller-shaped seconds counter, steel with black PVD left fast- action start / stop / reset trigger, screwed yellow rubber crown with bayonet safety system and red ring, black PVD automatic Helium valve, domed sapphire crystal with anti-reflective coating on both faces, screwed steel case back with shark imprinted and limited edition serial number, integrated yellow rubber strap, steel folding buckle with diver extension. Limited edition: 200 pieces.